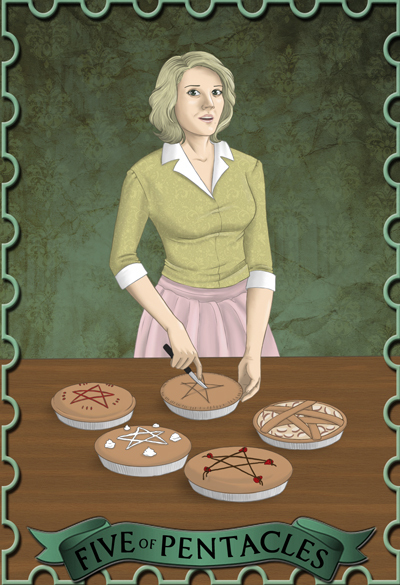 The idea for incorporating pentacles into pies struck me the moment I saw the prompt for Karen Singer, but with my current workload, I ignored the temptation to claim the prompt. When several days went by with no one laying claim to it, I had to give in! There are a few ladies in the Supernatural verse that I feel deserve fanart (hence my previous card, featuring Claire as the Page of Cups) and Karen is definitely one of them. In the end, I’m pleased with everything but her face — despite keeping a close eye on a reference image while doing the lines, she ended up looking more like Buffy’s mom than Karen. The pies were the most fun… although I’ll admit, by the time I hit the chocolate drizzle and strawberries, you can tell I was running out of ideas!